With all the advances that the Internet has brought, never has there been an easier time than today to manufacture your product and to bring it to a world-wide potential audience of millions with the simple click of a mouse. In fact, there have been more products brought to market these past five years than have been introduced in the previous twenty years. When considering just how complex business is these days, what was a routine procedure of selling and/or producing your product has now become a cause for concern, quite possibly a product liability exposure. This is where it makes proper business sense for your company to acquire a Las Vegas/Clark County, NV Product Liability Insurance Policy in addition to your other Las Vegas business liability insurance policies before your company starts to sell or distribute your products, either through a retailer or wholesaler or directly to the public. In most cases, it doesn’t matter what role your company will play in the product’s pipeline, whether it be of a distributor, wholesaler, or manufacturer, almost every company you conduct business with will require a Las Vegas/Clark County, NV Product Liability Insurance Policy, and that will be regardless of whether your company has developed the product or it is simply acting as a sales rep for another company. When we discuss this type of insurance with our clients, we press upon them that even if their company takes every measure possible to avoid a claim, unfortunately, there are situations that will occur and can possibly harm a client, making your company liable for this action, hence, the need for Las Vegas, NV Product Liability Insurance Coverage. In acquiring a Product Liability Insurance Policy, it’s the duty of the insurance carrier to defend your company in the event of a claim, and the costs to investigate the claim, and pay out any judgment or settlement that may be made against your company up to the limits of your policy. In determining what the cost of a Product Liability Policy would be, several factors are involved in this process, such as the type of product you are producing or selling, what the sales volume will be in the coming twelve months, and exactly what role your company will play in this process. Please be aware that there is no standard rate table when it comes to these types of insurance policies, mainly because of so many variables concerning the product and whether your company retails it, distributes it, or is the main manufacturer. Products that pose little potential to cause damage or harm naturally have a lower premium, and, in reverse, if your product has a high propensity to be a risk, that insurance premium will be much higher to compensate for the risk the insurance carrier will be taking. In the Las Vegas/Clark County, NV area, each year, newly created and existing companies are producing a wide range of products that they are selling or distributing direct to the public through retailers or wholesalers. Some of the products sold or distributed include: hair products, food products, clothing, dietary products, health products, toys, tools, building materials, electronic devices, which are just a few among the thousands of products that are produced each year. When a company is manufacturing or distributing their product, the company needs to be aware that their product will always have a potential risk to someone, and having a Las Vegas/Clark County, NV Product Liability Insurance Policy in place beforehand is the best course of action for the company. 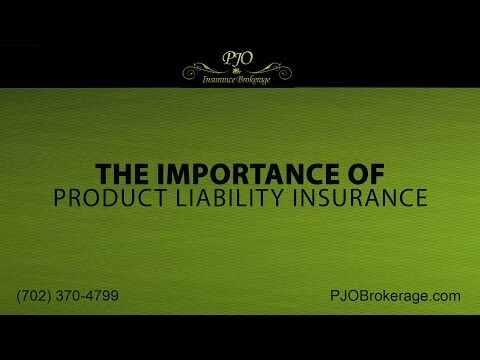 If you or your company are looking at developing a product, or if you already have one ready for market, the experienced and professional brokers at PJO Insurance Brokerage would welcome the opportunity to work with your company and put together an insurance plan that will suit your product liability needs.